Apple has confirmed a September 12 event to unveil what many believe to be the iPhone 5. While there are still questions about just what kind of devices Apple will be displaying at next week's event, there are still a few other rumors to address. 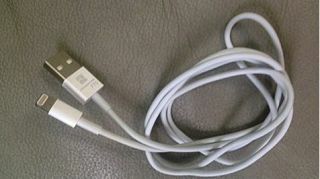 About a month ago, reports of a smaller dock connector began making the rounds, culminating in the leaked photo of what could be the iPhone 5's new cable. Though a new, smaller connection makes sense in conjunction with all the other specification rumors about the iPhone 5, there was still the curious question of adapters for existing devices. According to the most recent report, there will be adapters made for the new smaller dock connector. However, it appears that Apple will be the only company making them. No third-party cables or adapters for Apple's new iDevices? iLounge compared this latest report to earlier suggestions that Apple was not sharing specifications for dock connector accessories, or the cables themselves. Sources point to the new adapters costing $10 each, or $29 for three, and replacement cables running $19 a piece. By being the sole provider of the adapters, it's believed Apple will make nearly $100 million if early estimates of selling through 10 million adapters by the end of the year are true. According to iLounge, several developers are concerned Apple will have a stranglehold on the cable and adapter market, the very same way they do with their MagSafe connectors. Whatever the case may be, we won't have to wonder what Apple's plans are for much longer, as the company's plans will be unveiled in one week.